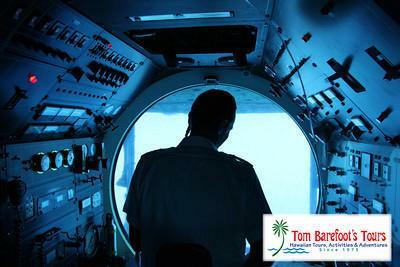 Atlantis Submarines is a unique activity in the islands, they own the only submarines in Hawaii that are strictly for civilian use. Today we went out on their submarine adventure on board their 65' air-conditioned, electric powered submarine. We met the ferry that took us out to the submarine at the Lahaina Harbor. We first picked up our boarding passes from the Atlantis Submarines gift shop that is located on the Front Street side of the Pioneer Inn building and then walked from there down to the harbor to meet the boat. Once we got to the harbor we boarded the ferry boat that took us out to meet the submarine. On the way out to where the submarine was waiting I talked with the Captain of the ferry about the dive site. He explained that the sailing boat "Carthaginian" which had been used for many years as a whaling museum at the mouth of the Lahaina Harbor had become too costly to maintain. The owners of the boat decided that sinking it would be the best course of action. When the operators of Atlantis Submarines heard of this they offered to cover the costs of sinking the vessel if they could sink it at a location that they could take their submarine to. The owners of the Carthaginian agreed and the boat found its final resting place off shore of Lahaina Town. As we got close to the dive site the white silhouette of the Atlantis Submarine could be seen rising out of the depths of the ocean next to the boat. Within a couple of minutes the submarine was parked along side the boat and the crew had positioned the gangplank between the two vessels. Once the gangplank was in place the passengers that were on the submarine from the previous trip filed off and then our group boarded the submarine. Once we were all on the sub the crew battened down the top hatch and then the Captain initiated our dive. 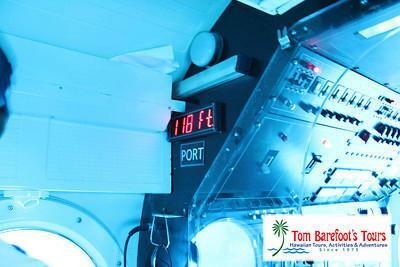 The submarine is fully pressurized and it did not take long for us to reach depths of 100 feet under the surface. 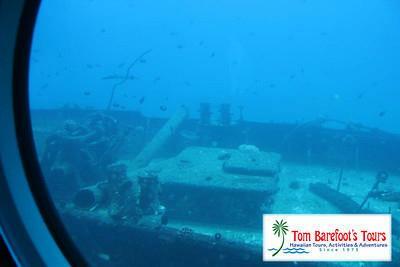 We passed some beautiful sections of reef, some very large schools of fish and then we finally reached the shipwreck. Since they sunk the "Carthaginian" there has been a great deal of life that has grown on it. The fish that populate the coral reef that surrounds the wreckage have seized the opportunity to find shelter in the hull of the boat. As we got close to it we could see a school of small Jack (Omilu) that were circling the hull looking for any smaller fish that were not paying attention that they could make an easy lunch out of. The Captain navigated the submarine very close to the wreckage so all the passengers could see before we moved on. By the end of the dive we had explored acres of reef and we had reached a maximum depth of almost 130ft. Using conventional SCUBA equipment we wouldn't have been able to explore such depths for such a long amount of time. Even if I had been diving with my extra long free diving fins in shallow water there is no way I could've covered as much area in such a short amount of time as we did during our dive. 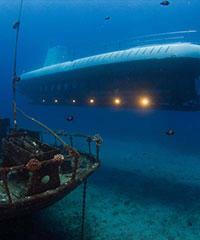 Marvel at Maui's unique underwater paradise aboard a high tech 48 passenger submarine. Guests view the unique fascinating natural coral reefs, fish and marine life in air conditioned comfort and safety, often to depths of 100 feet.